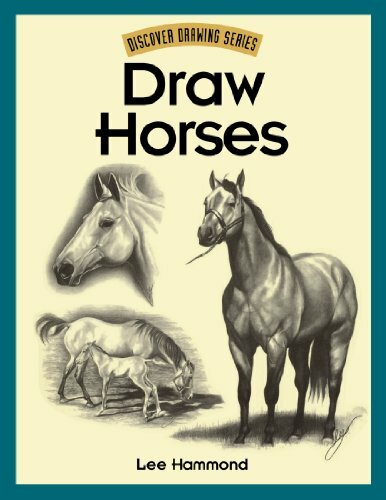 Why Should You Learn To Draw Horses? Drawing animals can be both entertaining and help you develop your own artistic style. Whether you want to draw realistic forms or create comical animal figures, practice and patience will likely be required. 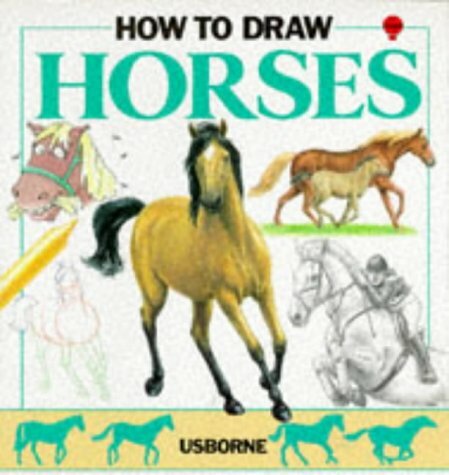 Learning how to draw a horse can supply you with the daily drawing exercise needed to improve your personal technique and can be useful in a variety of situations, from book illustration or greeting card design to developing your own unique comic strips. 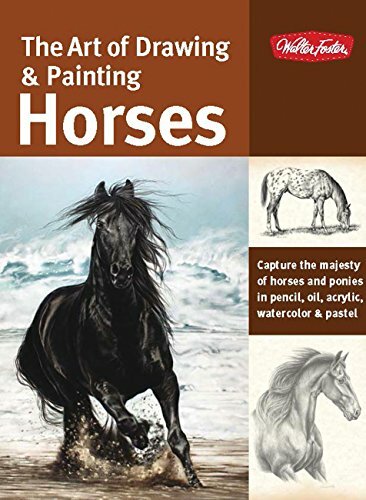 There are several different ways you can practice drawing horses, and each offers a unique approach, so you can discover the one that best complements your artistic style. Learning how to draw a horse can benefit you as an art student, a graphic artist or even if you simply love horses and want to express your appreciation and admiration of them through art. The conformation of the horse and all its many details can also provide you with the practice you might need, especially if you have only recently started drawing. If you enjoy writing short stories about horses, you can add illustrations to give your project a personal touch. Artists who can draw horses are often in demand for website illustrations, children’s books and veterinary textbooks, giving you a wide variety of career options if you decide to pursue art as a full-time job. Practice makes perfect, however, and there are several ways you can draw horses to perfect your drawing technique. Learning how to draw a detailed horse’s head can help you create a stunning portrait of this majestic animal. From the delicate features of the Arabian to the gentle and gigantic Clydesdale, each breed has its own unique features that can be brought to life through a sketch. The medium you choose to draw a horse’s head is up to you, but you will need a sketchbook, pencils and an eraser to begin this project. Before you begin drawing, choose the angle you want the horse’s head to represent. Side views are simplest to draw if you are a beginner, and front views provide more of a challenge because of the conformation of the eyes and the shape of the muzzle. If you are learning how to draw a horse for the first time, trying the side view first may give you the confidence to try more difficult positions later. To begin, create a simple horizontal curve, then extend it downward a few inches before making a narrow rectangle at the end of the line for the muzzle. Then bring that line upward before adding a vertical line to outline the top of the chest. Next, add two small triangles to the top of the head, which will become the ears once you start to round your lines. Add a half triangle and a small circle to the face to represent the eye and nostril. Once you have the basic shape down, use another pencil to round and smooth out the muzzle, cheek and line of the face. You can then add the mane and forelock before shaping the ears and adding detail to the eye. Learning how to draw cartoon horses can provide you with endless hours of enjoyment and help you develop your own characters for web cartoons, comic strips or simply for your own use. Cartoon horses have always been popular in media, from Quickdraw McGraw to the “My Little Pony” series, so learning how to draw a horse this way may be useful if you decide to go into the animation field later on. The first step to drawing a cartoon horse is to form a circle and section the inside into four equal parts. Then, add a smaller oval to the bottom portion of the larger circle and add diamond shapes to its top. To create the body, draw an elongated oval, so it is positioned slightly under the larger circle. This will be the body. Do not connect the two shapes yet. Add four narrow rectangles to the oval for legs, then add whatever type of tail you want. Add the mane to connect the shapes and position the forelock over the front of the face. Using the lines within the first circle you made, add eyes, nostrils and the mouth. Finally, finish off the nose by adding two small vertical lines from the circle of the nose to the forelock. If you live in an area where you can view horses close up, you have an opportunity to learn how to draw a horse using living models. This technique can help you learn how to create the basic form of a horse and to observe how they move to create realistic muscle conformation in your drawings. If you are a beginning artist, focus on the lines and curves of the horses you see and observe different colors and markings so that you can add details to colored drawings later. As you watch living horses, try to sketch out their shapes as they stand, gallop and graze. Your sketches do not have to be complete, as drawing horses this way is more of a lesson of shape than detail. For example, you can focus on the shape of legs, fetlocks and hooves on one page and heads on another. Practice shading manes and adding background detail to these drawings to help expand your experience. If the horse’s owner allows it, take some photos before you leave so you can finish up your drawings later on at your leisure. Drawing a horse from a photo or original drawing can teach you several important lessons about pencil drawings before you set out to make your own art. For example, it can teach you how to make fine lines and shapes with your tools that you can adjust or erase without compromising the drawing. Graphite pencils are typically best if you want to copy a photo. To begin, use light strokes to copy the form of the horse and forego adding any detail right away. Avoid drawing any heavy lines that you will not be able to erase later. Focus on the angles of the lines you are drawing until you create the basic contour of the horse’s body. Once this is accomplished, you can use a blending stump, your finger and different amounts of pressure on the pencil to shade in your drawing. You may want to start at the head and work downward, as shading smaller areas may help guide you into larger areas of the drawing, such as the chest or side, depending on the horse’s position. When it comes to learning how to draw a horse, this can be one of the most difficult techniques to master. Shading your horse all one color may cause it to look unrealistic or disrupt the contours of its form. Since this can be an important element in realistic drawings, practicing shading and creating a coat with depth, light and shadow may be well worth some practice time. Before you try this technique on a completed drawing, you may want to practice on a second. You can use a variety of art tools for shading, but pencils work best if you are a novice. To begin, start out with lighter shading so you can adjust the tone if you need to later on. If there are darker areas on your horse, create V strokes with your pencil tip using a medium amount of pressure. Remember to make the strokes all in one direction for the area you are shading, or it may confuse the eye. Over time, you will be able to create different shading techniques for a variety of settings that may help you expand your drawing portfolio. Learning how to draw a horse can be a challenge, especially for a beginner. However, while the above techniques may help you find your own special abilities, every artist has his or her own style that makes the artwork one of a kind. You can blend these techniques together or use them as a springboard to come up with your own style. As you learn to draw horses, it is important to remember that you will probably make mistakes at first. In fact, with each technique you learn, you might encounter different road blocks that make you feel frustrated. However, keep in mind that learning any skill takes practice and that you may not pick up the nuances right away. Give yourself time and accept any mistakes you make as part of the artistic process. No matter how you use your skill, knowing how to draw a horse can open various doors for you as an artist. Many artists say it is almost impossible to draw a horse without feeling some kind of joy at their beauty and spirit. Remember to have fun while drawing horses.